Dimensions: 8 13/16 x 6 7/16 in. *Medium: This is the only print in the catalogue thus far in which Fiene employed aquatint to such a significant degree. 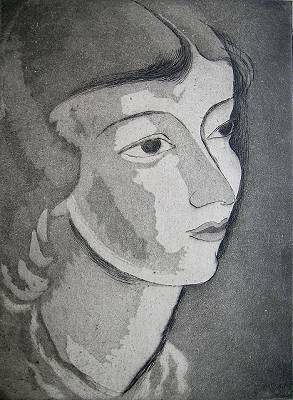 **Printer: Fiene is known to have printed at least some of his early etchings (an intaglio process like aquatint and drypoint) himself, having followed his signature with "Imp" to indicate this. Although George Miller was printing Fiene's lithographs by 1927, he is not known to have printed any of Fiene's intaglios.